OR YOUR HOME AWAY FROM HOME! An RV skylight is so much more than just a window to the sky. It's an enlightening atmosphere! Experts say that natural light in an enclosure, such as a home or recreational vehicle helps alleviate mood swings and stress. Not only that, but a skylight that opens can even promote good health and, especially throughout the cloudy winters, prevent depression! Today, the research is impressive and is even "green" technology in some fields. New designs offer double glazing and coatings which let in varying degrees of light, while filtering out harmful UV (ultraviolet) rays. Closed, these skylights hold in heat while some designs actually enhance and amplify the incoming sun's rays. Opened they let in fresh air, block out insects and reduce the humidity of RV interiors. Polycarbonate is a sheeting which is strong, lightweight and stands up to harsh conditions, such as extreme high temperatures of the desert and hard freezing conditions of the frozen tundra. But, besides being very strong (about 200 times stronger than glass! ), this material is about a sixth lighter than glass and made to last many more years longer than the older plex or plastic skylights. They are virtually unbreakable! Adverse outdoor conditions are something RVers simply have to contend with, like hail storms, thunderstorms and conditions in heavily wooded areas. 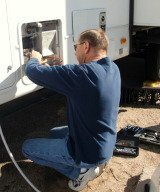 New polymer technology is the RV owner's friend. If your old skylights are starting to show signs of age or are cracking or leaking, see what's available. You'll find that, not only are they better today, but cheaper as well. Replacing a skylight or two is a DIY project which can be accomplished by nearly anyone. And, today you have a wide range of options. Different filters, allowing varying amounts of transmissivity ratings (light passivity) and translucency ranges along with diffusion and filter coatings make shopping for skylights a fun adventure. Your RV, and therefore your rig's skylights, take a lot of abuse. Falling tree branches, storms, harsh rays from the sun and strong winds pound away day after day outdoors. If you live full time in your rig, it may never see the shelter of a garage or carport. So, why not climb up on the roof and check out what you have? Even if the present skylights are fine, you might just get an idea to add one or two ... in the bath or over the table for instance. Skylights make such a big difference, especially in a motorhome, fifth wheel or trailer, you'll wonder why you didn't think of this sooner! For more information on what's available today, search rv skylight, polycarbonate skylight or skylight technology using the Bing Custom Search Box Click Here. Or, for videos on installation, go to YouTube and search rv skylight installation.